The Indecisive – The question is simple, what do you want to eat? The response is complicated. “I don’t know, maybe, I usually like that but not today, hmmmm, just wait don’t order, you order first, wait wait, I don’t know what I feel like, ummmm”. The Hygenist – The person who wipes down all of their cutlery with the inside of their serviette before eating (the inside of the serviette hasn’t yet touched the dirty table), then reaches for their bottle of hand sanitizer out of their bag after touching the dirty menu. 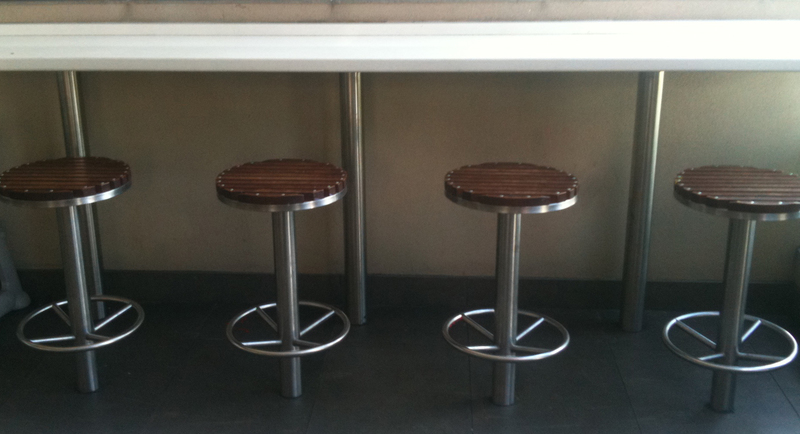 Beverage control – This person orders a bottle of wine for the table and beers where necessary. Your glass of water seems always full because they are consistently topping up your drink, they know the importance of staying hydrated and want to share the gift of water. As you take the last sip of your beer, they have already ordered you another of the same. Glutton – Their eyes are way too big for their stomach, they insist on ordering everything on the menu and lots of it. Suddenly when the food arrives they’re ironically not that hungry anymore. They usually instigate dessert when everyone is soooo full they’re already on the verge of barfing. Custom Made – This person always orders something that is not on the menu. They see a dish on the menu and create their own rendition to suit their needs. They are big on extras and exclusions, mix and match sauces and ingredients included but on the side. These characters are easily identifiable when water can not, and will not be consumed without a fancy slice of lemon. The Vegetarian – To hell with meat! they protest. They are ecstatic when the choice of venue is Veggie Bar on Brunswick street and disinterested in attending dinner at Steakhouse in Port Melbourne. No meat? No thankyou! I say, but each to their own. However some like to repeatedly mention that you are eating a once live animal whilst engaging in your meal of choice. I know it’s factual but denial is a happy place. Garbage Disposal – When everyone is full to the brim, this character eats the food that is left over so people don’t feel bad that they’ve wasted all this food when there are starving children in third world countries. The Financier – The person who grabs the bill when know one wants to look at it and rounds up the monies for our departure. There’s also the dude who likes to pull out their iPhone to calculate the cost per person right to the very cent. What often goes unnoticed is that the peculiar imperfections of each character create the circus of madness you need for a memorable meal. So appreciate the net of balance you’ve unintentionally chosen to join your table in life. My brother and I decided to create a battle to determine who is the better sibling. Instead of a fight to the death we thought we’d have a gobstopper challenge. A gobstopper is a hard lolly also known as a jawbreaker that looks a bit like a ball made of plaster splattered with paint by abstract artists…edible paint and plaster of course. We chose gobstoppers because they’re way too hard to bite without risking serious dental damage which means it takes an extra long time to actually finish one. This way we can genuinely evaluate the components of strategy, technique and endurance. When channeling all of your energy into consuming a gobstopper, innovation and creativity plays a key role. We found little things around the house that the gobstoppers could sit in, be eaten in, sleep in ect. We had to prepare and basically readjust our whole lifestyles to cater for the lil’ stoppers. 1. 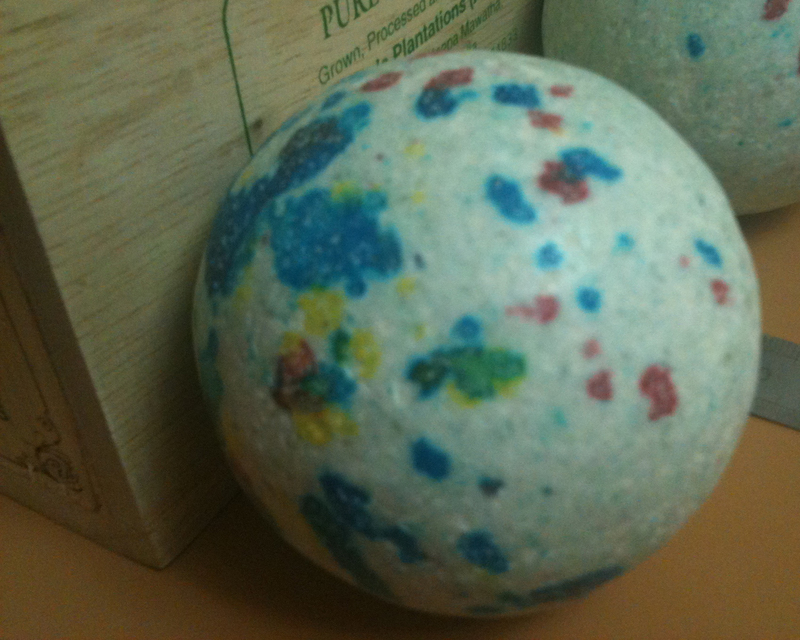 The gobstopper is not to be taken into the shower with you. 2. You must not walk in the rain with the gobstopper exposed. 3. You can not take the gobstopper swimming. 3. If the gobstopper gets dirty, it is your own fault and must continue without washing. 4. Monthly measurements are mandatory. 5. No smashing the gobstopper into pieces. 6. If the Gobstopper comes into contact with water accidentally you must fill out a gobstopper incident report. I ate it all, I lie. I barely scratched the surface. On the fourth day I binned it, my teeth hurt and I couldn’t sleep properly. Passers by were staring at me at the shops and I repeatedly had to tell friends the reason why the gobstopper had to come along too. My brother survived a few more days but bailed not long after. The challenge was not completed and it was the gobstoppers who won this round. So the question still stands…who is the better Fredericks? I was planning a dinner party and tried to veer away from the usual themes like Italiano, Thai cuisine, Mexican Alla Boring. So I decided to plan a three course meal where the key ingredient was “S”. 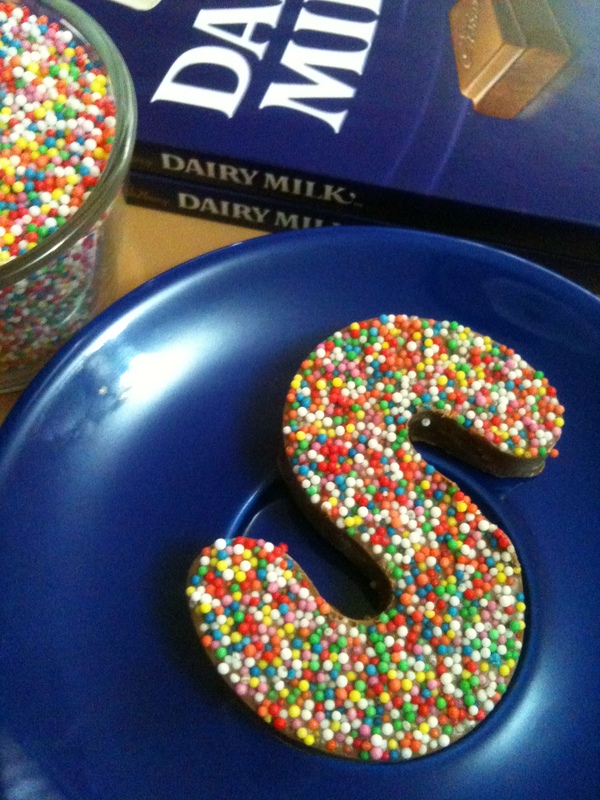 That’s right, every dish started with the letter “S”. First up as an appetizer we had Spanish onion Soup with Sourdough croutons. The main event was Spagetti with Salmon, Spinach and Sundried tomatoes. And to end the evening, Scones with Strawberry jam and Spray whipped cream. Of course there were added ingredients that started with other various alphabet letters but lets not be disheartened by those minor details. You can go that extra mile and put Serviettes on the table, bring out your finest Silver wear and only serve Sauvignon Blanc all night but that’s up to you. It was a Success! It was interesting just brainstorming the possibilities. Then it got me thinking of other themes that could be unique yet palatable. A colour theme? yes lets work with the colour orange. For entrée you could have a homemade pumpkin soup. For the main, an apricot chicken stir fry with carrots and sweet potato. Finally an orange and vanilla panna cotta. 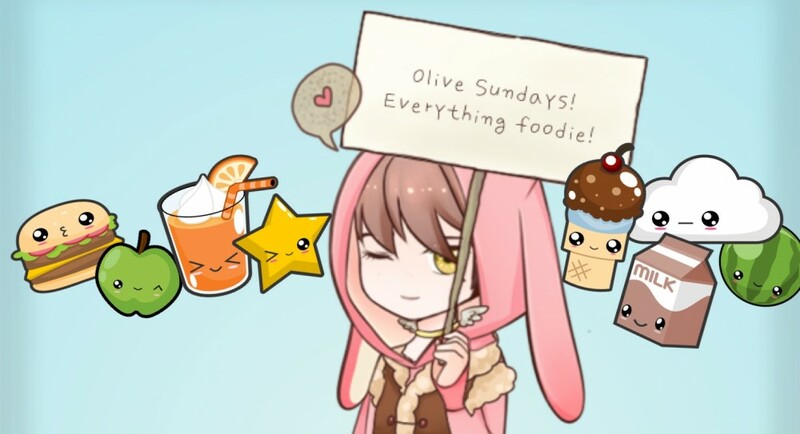 om noms! Or maybe focus on a single product and explore its many forms. Like corn for example. you can warm up conversation over a cup of corn tea, have grilled seasoned baby corn for starters, chicken and corn risotto balls battered in cornflour for main, then corn ice-cream for dessert. ahh way to much corn in one meal. scrap that. How about your name as the theme. Well my name’s Mel, so for example I would serve something like cara-Mel flavoured marsh Mel-lows with Mel-ted chocolate aside scoops of Mel-on? I don’t know but weirdo themes are good fun and can make the dinner a lot more thoughtful than your average roast. Try it next time you organise din dins at your place. Ever since I can remember, I have disliked vanilla ice cream because it was bland, uninteresting and didn’t have a strong appeal next to all of the other ice cream flavours. Why have vanilla when you can have honeycomb, rocky road, boysenberry, peppermint, ultra mega triple chocolate attack etc.? 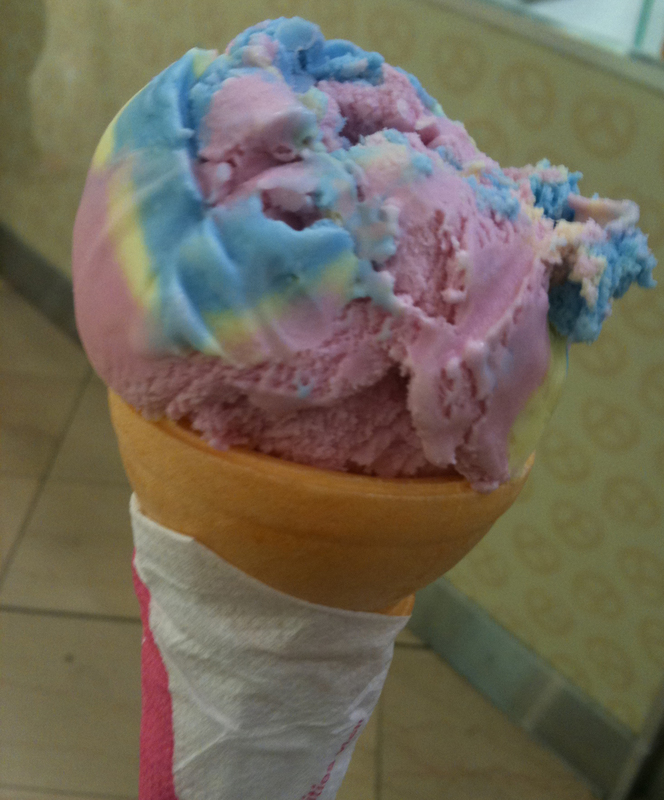 my favourite flavour of all time is rainbow ice cream from Wendy’s…or so I thought. Just the other day I went to Wendy’s to buy the usual tub of rainbow ice cream when it dawned on me. What is this joyous flavour of rainbow I am so fond of? My curiosity led me astray and I chose to ask the lady at the shop front the question. The answer of which I would later on dread for years to come. What flavour is rainbow ice cream? I ask. As soon as the words left my mouth, I felt an instant feeling of regret. Before I could stop her she announces… Behold! the flavour you have spent so many years building a valuable relationship with is in fact plain jane vanilla ice cream with rainbow colouring. I couldn’t believe it. Is this a dream? Is she joking I contemplated? then for the first time I looked closely at the ice cream description and there it was, in black and white, it said ‘rainbow COLOURED ice cream’. I watched my rose-coloured glasses fall on the floor and shatter into a million pieces. I was confronted by the painful reality of deceit. My most hated ice cream has been charading as my favorite ice cream all along. In retrospect the colours of the rainbow tasted something like pink fairies, blue baby unicorns and yellow morning sunshine. Now when I try to imagine these magical wonders of the rainbow, my thoughts are tainted by vanilla bean meanies controlling the lands. Sort of like that care bare episode where everyone is the colour grey and miserable because someone stole the colour from their world. You know the one. This particular rainbow ice cream was vanilla, but fear not! It has been scientifically proven that not all rainbow ice cream is vanilla, recent research shows that there is an exception to the rainbow paddlepop and some ice cream parlours sell bubblegum with rainbow colours…another misconception. Oh the shame! In conclusion, what ice cream charades has taught me is to not be fooled by the pretty packaging of life and find out what your actually consuming.